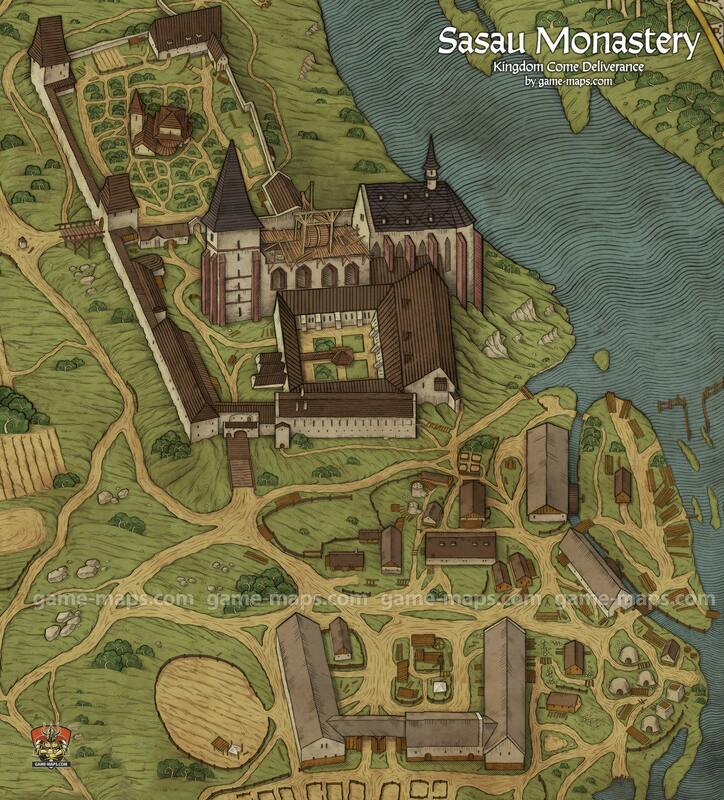 Map of Sasau Monastery in Kingdom Come Deliverance KCD Video Game. Sasau Monastery is situated on a cliff above one of its many meanders of the river Sasau, isolating on various sides. Its origins date back to the first half of the 11th century, when it was founded by Duke Oldřich at the instigation of the monk Procopius. Saint Procopius (canonised in 1204) became renowned particularly for wanting to preserve the Old Church Slavonic religious rites in the monastery, rather than adopting the Latin liturgy. According to the oldest document mentioning the construction and development of Sasau Monastery, "Vita Maior: the 11th Century Legend of Saint Procopius", the saint initially lived in a cave before building a church consecrated to the Virgin Mary and Saint John the Baptist. After the expulsion of the Old Church Slavonic monks from Sasau, the monastery was taken over by Latinist monks from Břevnov. Abbot Děthart continued with the rebuilding works, completing a simple, single-nave church in his lifetime. From the mid-12th century onwards, work resumed on the original plans and the abbey church was reconstructed into a massive, ornamented, three-nave basilica. The oldest, simple wooden edifices from the beginnings of the monastery included the cloister (monks’ quarters), the prelature (abbot’s quarters) and the infirmary (refuge for pilgrims). The cloister around the elysian courtyard consisted of a quadrangle hallway with window openings, the monks’ dormitory, the chapterhouse, the study and the refectory (dining room) and kitchen.